We look forward to seeing students, staff and families back at school on Tuesday 25th July. Please note details below re our fourth and final student free day for this year (as shared earlier in March) on Monday 24th July. Craigburn staff will be joining with teachers from Flagstaff Oval Preschool and Braeview Primary School in a workshop on Growth Mindsets. 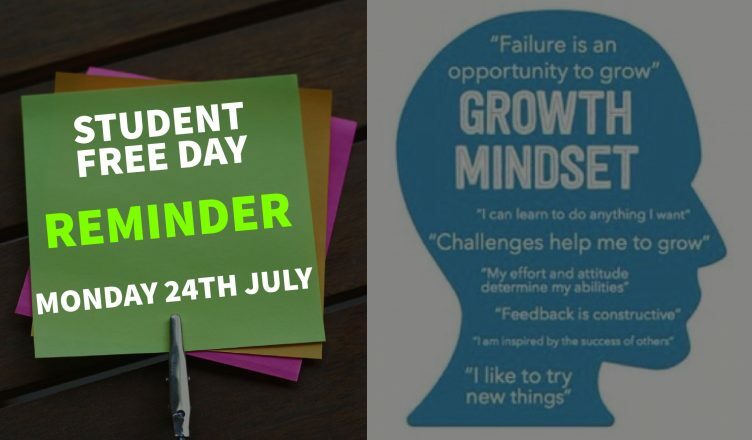 The presenter is James Anderson, Australia’s leading growth mindset trainer whose work is based on renowned Stanford psychologist Carol Dweck, who has identified a critical component to succeeding in all aspects of life. The Growth Mindset is a common factor in the outlook of practically all high achievers. In the workshop, James Anderson will offer practical tools and strategies to help us to develop a Growth Mindset in our students. As always, we appreciate the opportunity to further our professional learning and thank our Governing Council for endorsing this date earlier in the year. OSHC will be open for bookings.